We have partnered with the wonderful Kith & Kin in Chapel Allerton to offer you a wonderful Mother’s Day prize. 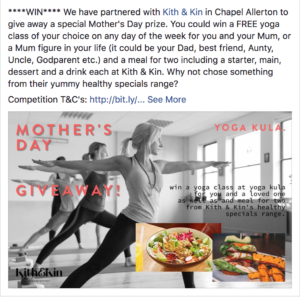 Win a yoga class for you and your Mum or a Mum figure in your life, such as your Dad, Aunty, Uncle, Sister, Godparent, Cousin – the list goes on and on, as well as a delicious meal in Kith and Kin Chapel Allerton for you both. Enjoy a starter, main, dessert and a drink each on any date of your choosing. To enter please like the Yoga Kula and Kith & Kin Facebook pages and share the post. It is as simple as that!